Good morning all! 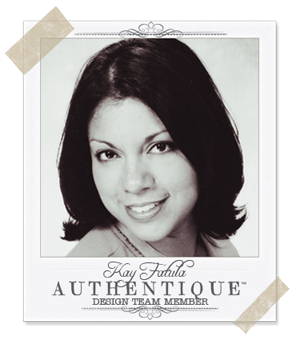 Kay here with my project using the fabulous 'Anchored' collection by Authentique along with Top Dog Die products. I decided to do a masculine themed type of card & added just a touch of softness by incorporating a bit of doily designs into the mix. This card comes along with a matching card box envelope. My cards tend to have a lot of dimension--so regular envelopes hardly ever work for me. So I find myself lately making a matching card box envelope for any cards that I create. This card box envelope measures 6" x 6 " inches and is 1" inch deep. It houses my card perfectly! On the cover I've used two Top Dog Dies. 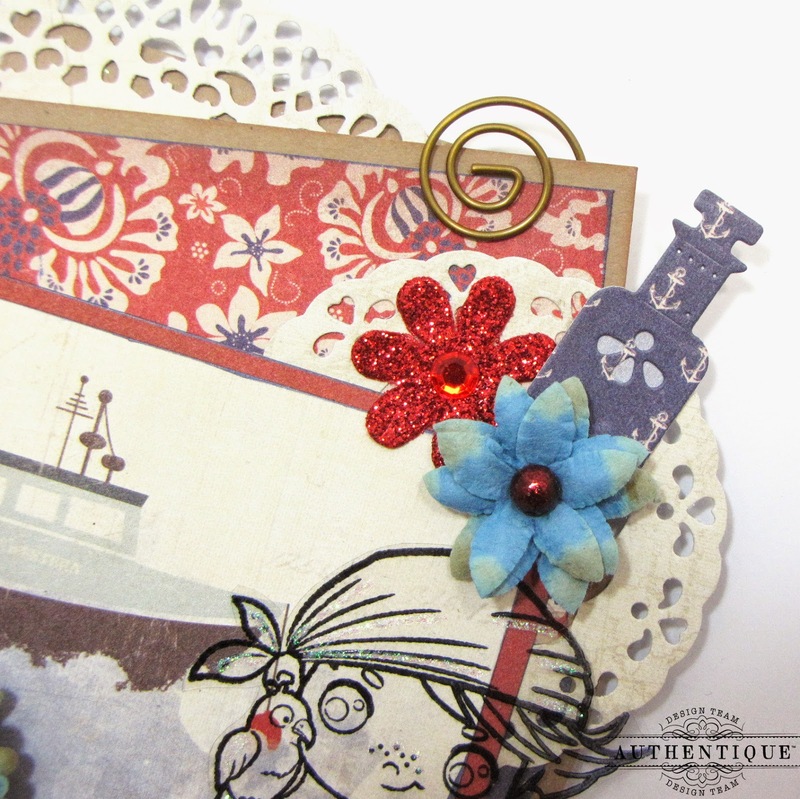 Both doilies seen peeking around the layers of my card are from the 'Cherish Doilies & Tags' die set by Top Dog. I really enjoyed the intricate details of this die. That really cute little bottle is also by Top Dog Die--it's from their 'Bottles #1' set. 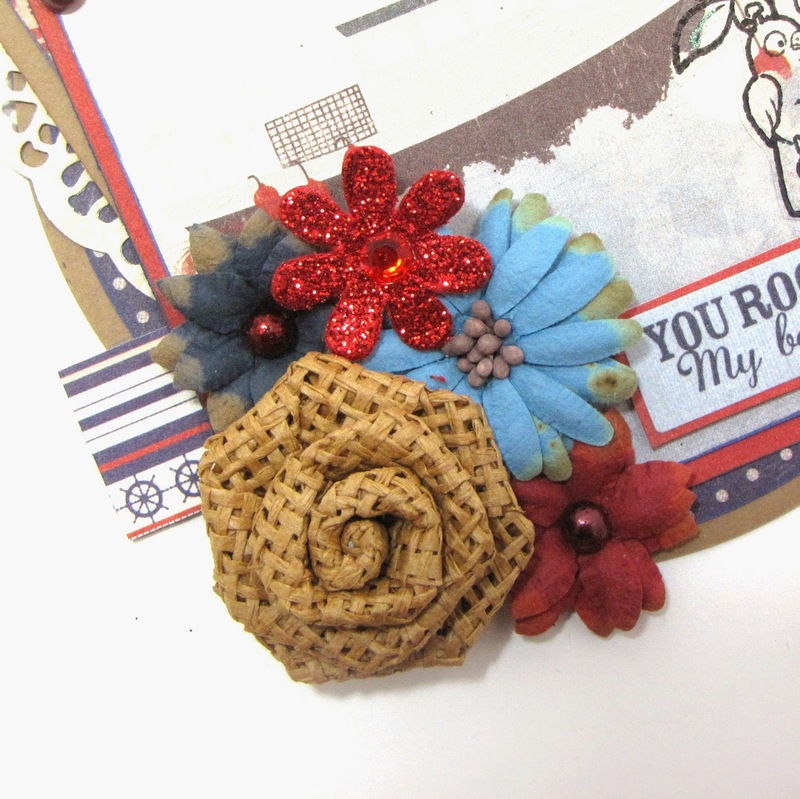 To keep with the masculine theme I used a burlap type of flower from my stash and added a couple of Petaloo flowers in red & blue around it in order to create my cluster. This little guy is a stamp. I stamped the image onto a piece of acrylic. I didn't want to cover any part of the boat design that I decided to use on the cover of my card--so going with a transparent image seemed like the way to go. All I did was add a bit of Star Dust Stickles to my little pirate in order to dress him up a bit more. The base of my card is also a Top Dog Die. 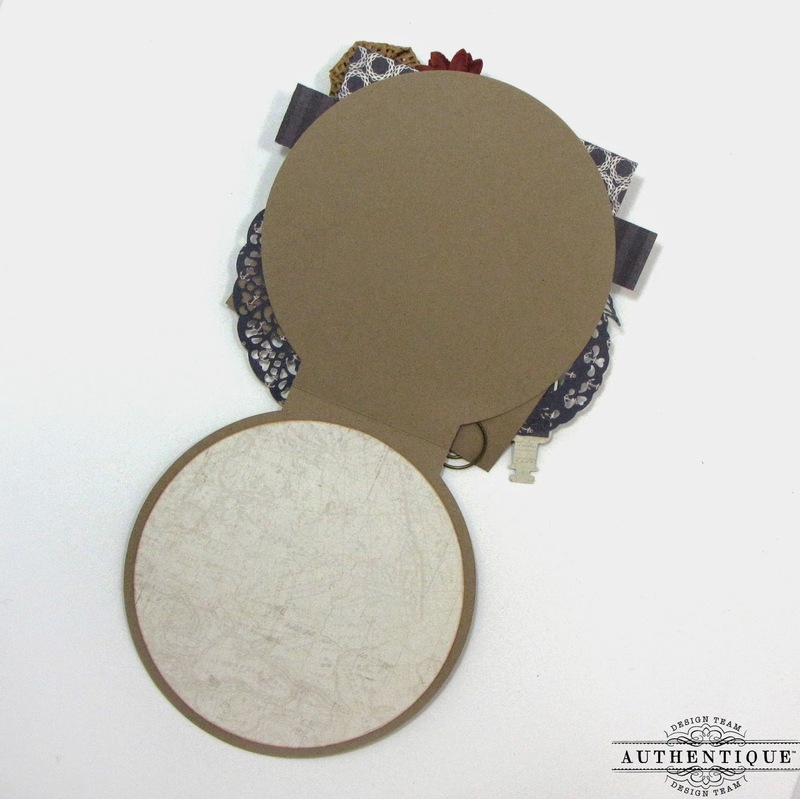 This circular die is designed to be used for mini albums--but I found that it also works great for making cards. I just folded a piece of card stock in half & ran it along with the die through my Big Shot making sure that I left just about a 1/4" of an inch at the top uncut--this created the base of my card. 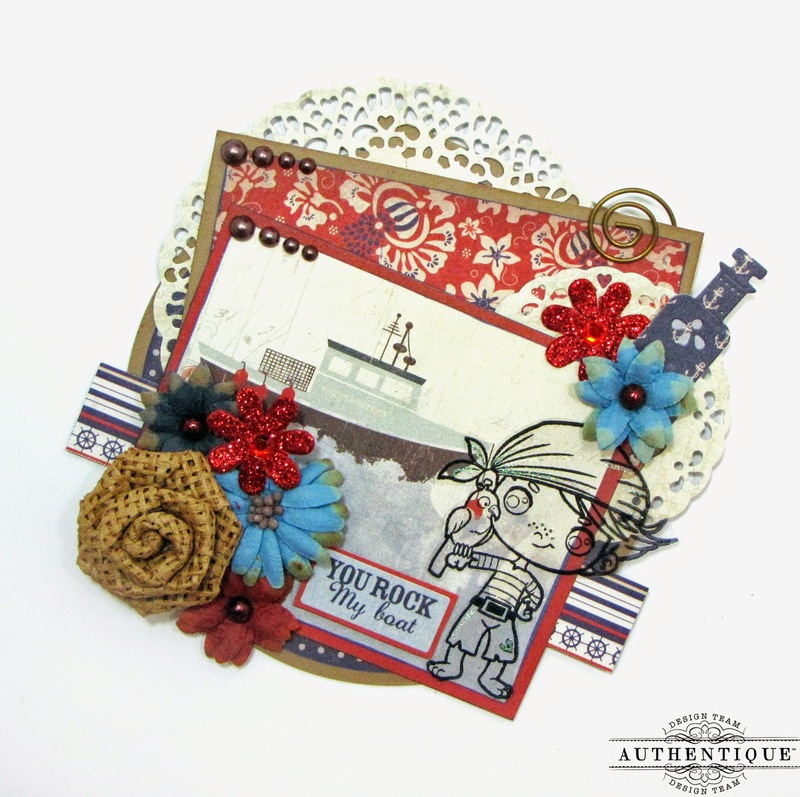 I already love the Anchored collection but this little mini album is fantastic! Love the doilie die from Top Dog especially!! Great job! You made a card but I think it would really make a fantastic mini album! And your little pirate is adorable! Love the way the pirate bleeds over into other parts of the card instead of being centered on one piece. Really adds interest. The layering is great. very very lovely, love the mini journal, I'm just floating away with that!! Beautiful project! I love all the different textured flowers. How cute is that love the little stamped character; like the prints in the Anchored Collection! Gorgeous masculine card and envelope! Love it! Love all the gorgeous flowers and dimension. Very inspiring project!!! What a gorgeous layout! I love the stamped image as all of the flowers! Thanks for sharing. I love this paper! I would never have thought to add a "cute" image with it, but it still works! TFS! Ahoy me mates jump the plank to catch the waves of me wonderful card! Totally awesome!! I love how she was able to do an identable masculine card and a female card with just a few little changes. This is awesome. Love love the colors!!!!! I have always loved authentique for the fabulous quality of their papers and their accessories. The colors of this collection are just gorgeous. Lot's of nice layers on your card and a fun shape also. Sweet card! I love the little bottle and the doily dies! Great choice of papers and embellishments! Wow, this card and envelope are over the top gorgeous! Love the dimension, layers and the use of the beautiful Anchored collection! Love the doilies die! Thanks for the inspiration! Fabulous. I like the pirate and the bottle die. 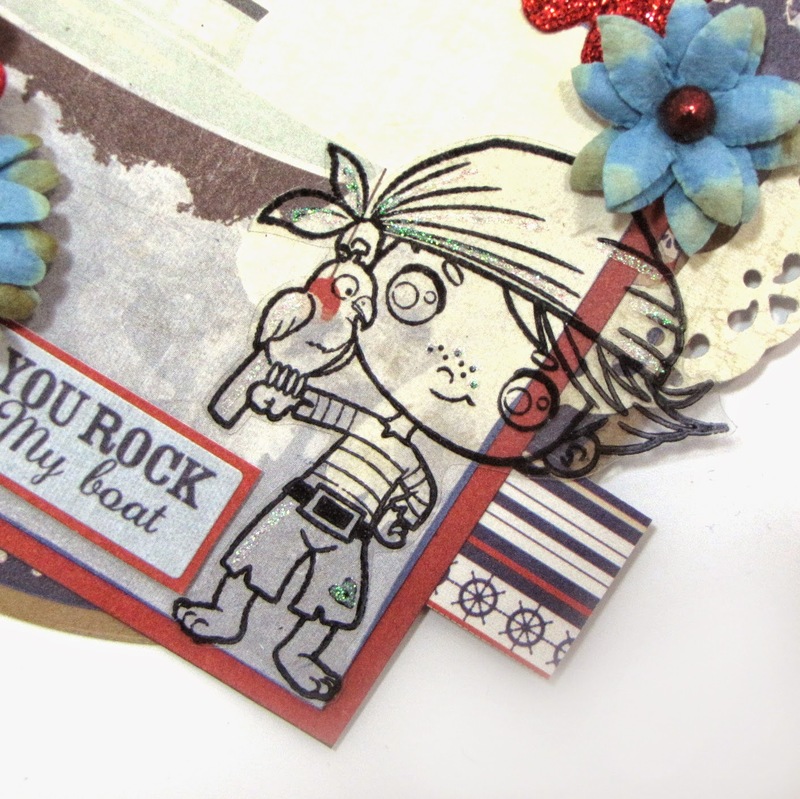 That pirate & the bottle are the perfect touches to your card! I am not a card maker but I want to make this one!